Cook chicken patties as directed on package. Top each patty with 1 ham slice and 1 cheese slice during last 1 to 2 minutes of cooking time. Meanwhile, spread cut sides of buns with honey mustard. Top bottom halves of buns with lettuce and chicken patty. Cover with top halves of buns. Cordon bleu refers to proscuitto and Gruyere cheese sandwiched between two chicken or veal scallops. The stack is breaded and fried. Other types of ham or Swiss cheese could be used instead. These ham and cheese-topped breaded chicken patties are a shortcut to classic cordon bleu. 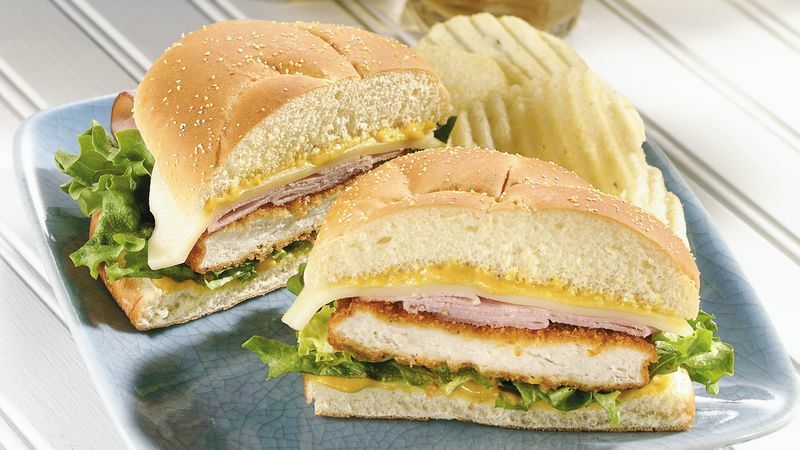 Sweet and tangy, honey mustard jazzes up these sandwiches. Mix your own with equal amounts of honey and your favorite mustard. Fresh fruit and potato chips complement these rich sandwiches. Beer or sparkling water are a refreshing beverage choice.